The Footprint Company has been working with Macquarie University since 2011 to deliver key outcomes for student learning and engagement, sustainable buildings, public reporting and project management systems integration. The Property team at Macquarie University (MU) sought to know how their Green Star projects measured up in terms of Ecological Footprint. The Footprint Company (TFC) carried out a pilot assessment on the Australian Hearing Hub (AHH) at MU using their Multi-Use Calculator. The results of the exercise highlighted the need to apply life cycle assessment and whole of life performance targets for all capital and operational elements. Driving operating energy efficiency can add more embodied carbon than is saved operationally; this shows how carbon ‘payback’ should be applied to ensure the most efficient carbon footprint is delivered. A ‘One Planet’ pathway was defined to bring about radical thinking but also highlighted the need for a ‘whole of campus’ approach to the built form for key infrastructure such as transport, water and energy. 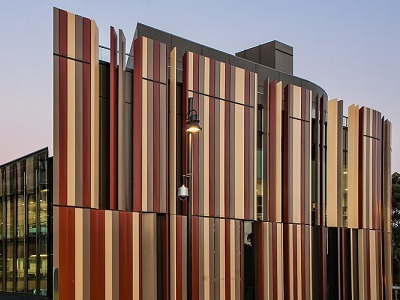 An iconic and world class knowledge and teaching facility, the new university library makes a radical departure from traditional libraries with the use of the largest robotic book retrieval system in Australia. Integrated technology on the floor demonstrates how economic, technological and ecological efficiency can be simultaneously delivered. TFC employed their Multi-Use Calculator to evaluate the design and validate the as-built outcome, a year after completion. TFC also made further recommendations for future improvements, which could deliver an additional 15% environmental benefit. After an extensive review, Macquarie University adopted ‘Ecological Footprint’ as the method for measuring and reporting its sustainability efforts and set an ambitious One Planet target for the campus by 2030. The University believed that the concept of One Planet was accessible for its diverse set of stakeholders, and also appealing and intuitive for students. Deploying a customised branded cloud platform, TFC continues to support the MU Property team with integrated development as well as multi-use applications for all developments and fitouts, enabling real-time comparison of all projects. TFC additionally provides an annual assessment, validation and reporting of the total footprint with the property and sustainability teams; using their Campus Calculator; a public reporting interface; and environmental management students’ life cycle assessment learning.